Adolfo (elbow) played catch Wednesday, James Fegan of The Athletic reports. Adolfo underwent Tommy John surgery in July. 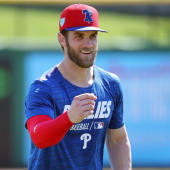 He resumed hitting in January and is now able to throw, though it remains unclear when he'll be ready to play the field in a game.